Total War: Shogun 2 Heaven » Forums » Guides & Articles » Ninja! Ninjas are masters of spying, sabotaging and assassinating. Ninjas can make rival generals or agents "Dissapear".. for a small price, of course. 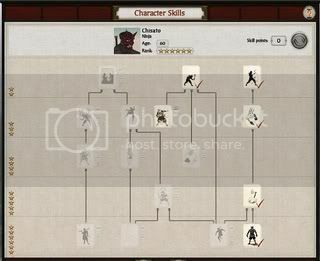 To assasinate, select your ninja and right click on the soon-to-be victim. A panel will appear with the targets and the chance of success of each one. 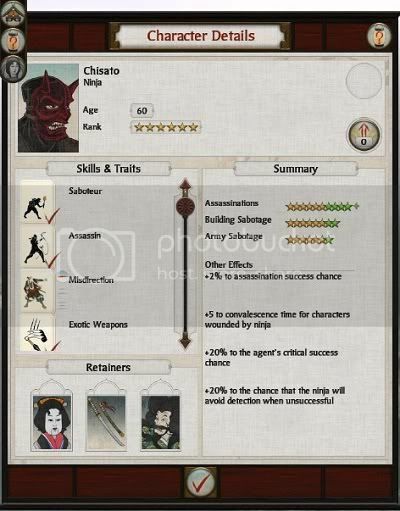 The percentage depends on the skill of the ninja and of the target; Daimyos will be harder to kill than monks, for instance. Every army, fleet, agent or anything belonging to you will uncover information about rivals if they are in close range. Ninjas can reveal more details than other agents or armies. Ninjas have a large line of sight, they can go discovering the map or improve the line of sight of an army or castle. If a ninja is embedded into an army, it increases it's movement ability and protects it from being demoralised by enemy monks or missionaries. Ninjas can damage enemy buildings. Select your target wisely. If you wish to cause unrest you may want to target temples, but if you destroy a farm, they will lose money and may be unable to pay the upkeep for their armies, for instance. Ninjas can also sabotage armies, poisoning food and water supplies. The army will recieve slight casualties and not be able to move for a turn. If a ninja is garrisoned in a castle, he will police the streets and make sure no enemy agent is freely walking the streets undetected, and may even get the chance to eliminate them. He also increases the line of site of the castle. It is free, but your agent gains very little experience while doing this. Ninjas gain experience though successful subterfuge. Each rank gives the ninja more points to spend on improvements and a total of three retainers. Sabotaging buldings or small armies are a good way to train your ninja up, as they are cheap and do not have many risks. Spy In silence much may be learned. -Level 1: +1 to subterfuge when spying. +5 increase to campaign map line of sight. -Level 2: +2 to subterfuge when spying. +10 increase to campaign map line of sight. -Level 3: +4 to subterfuge when spying. +15 increase to campaign map line of sight. Saboteur There is beauty in destruction, and in flames. -Level 1: +1 to subterfuge when sabotaging buildings. -Level 2: +2 to subterfuge when sabotaging buildings. Assassin A knife is truly dangerous only in the right hands. -Level 1: +1 to subterfuge when assassinating. -Level 2: +2 to subterfuge when assassinating. Military Spy An army, for all its strength, can be a delicate thing. Level 1: +1 to subterfuge when scouting in the field. -Level 2:+2 to subterfuge when scouting in the field. -Level 3:+4 to subterfuge when scouting in the field. Infiltrator Leave no footprints, even in darkness. -Level 1: +5% to the chance that the ninja will avoid detection when unsuccessful. -Level 2:+5% to the chance that the ninja will avoid detection when unsuccessful. Misdirection Confusion is a powerful ally and friend. -Level 1: +1 to subterfuge when sabotaging armies. -Level 2: +2 to subterfuge when sabotaging armies. -Level 3: +4 to subterfuge when sabotaging armies. Exotic Weapons Anything is a weapon, a weapon anything. -Level 1: +2 to convalescence time for characters wounded by ninja. -Level 2: +1 to subterfuge when assassinating. +5 to convalescence time for characters wounded by ninja. Criminal Contacts In the service of the great, a man must choose strange friends. -Level 1: +1 to subterfuge when establishing spy networks. -Level 2: +2 to subterfuge when establishing spy networks. -Level 3: +4 to subterfuge when establishing spy networks. Master of Disguise Lies made flesh are not falsehood. +5% to campaign movement range for the army this agent is embedded into. -Level 2: +10% to the chance that the ninja will avoid detection when unsuccessful. +10% to campaign movement range for the army this agent is embedded into. Gunpowder Alchemist Fire, sulphur and demon's breath are tools for the cunning. Escape Artist There is always a way out. Always. -Level 1: +10% to the chance of escaping from enemy agents. +10% to the chance of escape following an unsuccessful action. -Level 2: +20% to the chance of escaping from enemy agents. +20% to the chance of escape following an unsuccessful action. Poisoner Death comes in many forms, not all of them edged. Noble Bandit Giving away another's riches is wisdom. -Level 1: -15% reduced action cost. -Level 2: -30% reduced action cost. Invisible To hide is one thing. To walk abroad another. Ninjutsu A lifetime to master the art of stealth is time well spent. -Level 1: +3% to the agent's success chance. -Level 2: +6% to the agent's success chance. -Level 3: +9% to the agent's success chance. Notorious Killer Reputation is a weapon forged from your enemy's fears. -Level 1: +10% to the agent's critical success chance. -Level 2: +20% to the agent's critical success chance. The Hattori Clan is a specialist ninja clan, and get extra benefit for their ninjas. The higher rank the ninja is, the better it will be. But you cannot gain all the skills, and you will have to chose what your ninja specialises in. Shall he be a knife in the dark, killing many? Or maybe spying on the enemy? The choice is yours. It may be a good idea to keep your ninjas close to each other. One can scout the field and clear the way for another to enter and kill the target. If a ninja is imbeded embedded into an army, it increases its movement ability and protects it from rival agents. I don't think the bolded part is correct. I think only embedded Metsuke protect the army from other agents. I think the Ninja only increase movement and line of sight. Ninjas are masters of disguise and dishourable dishonorable warfare acts, such as spying, sabotaging and assasinaing assassinating. I would write it as "spying, sabotage, and assassination," though, just to make it sound better. Either farms; reducing enemy profit, "Happiness" buildings like Temples; causing unrest, or military buildings; reducing recruitment. The semi-colons and commas should be switched, and there is no sense in capitalizing "happiness." Ninjas gain experience though successfull subterfuge. The Hattori Clan is a specialist ninja clan, and get extra bennefit for their ninjas. The guide is a good overview. It could be improved by adding some commentary about how best to use them, though. Maybe offering EoJ's suggestion of using ninjas in pairs, for example. Also, it's worth noting what kinds of actions net the most experience for the least cost. There may be some debate on that, but I find sabotaging gates and buildings gain fair experience at low cost. I think only embedded Metsuke protect the army from other agents. I'll check later. I think I may have got mixed up. So it should be "Either farms, reducing enemy profit;"? there is no sense in capitalizing "happiness." Act of habit, I accidentaly capitalise after almost any punctuation (.,;: ). I won't change it because I don't actually want that to go on the site, I just couldn't think up the word I should use, hence the "". Know anything better to relace it with? I will update it when can with some tactics on how to use them and the experience, like you said. PS: I am planning on doing one of these for each agent, do you think the Geiha and Ninja should go together? A ninja placed inside a friendly army can increase their movement ability and prevent enemy monks or missionaries from demoralising them. I guess I'll fix it to change "Agents" with Monks. Gave it a little extra details here and there. Included EoJ's ninja-pair trick. One of the few things I have not used yet is the Geisha. Personally I am of the opinion that it deserves it's own article like the other Agents, the Geisha is just as thoroughly developed as the other agents. I thought that. I have only ever used one Geisha, I didn't even know I could get them because you need a really high level Stealth Chain building. Perhaps you could include a bit about their ability to garrison inside one of your settlements to increase its line of sight? It can be quite useful sometimes. Done. I also added establishing spy networks to the list. Spy networks also increase the line of sight for that province, useful for keeping an eye on your enemies. And I'm not quite sure, but I think spies don't increase happiness, they just increase the chance of catching monks trying to incite unrest. Only now am I realising I know less about Shogun 2 than I thought. That's one of the things I like about the game: I'm still discovering new stuff about it. If no-one else has any suggestions/comments I'll get started with publishing this on Wednesday. As a Ninja user myself, this is great. Thank you It's really not as good as I was planning it to be.